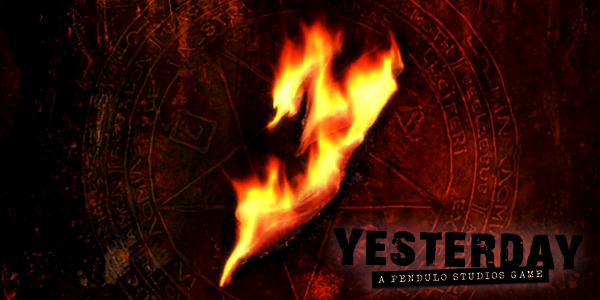 Yesterday is a single player point-and-click graphic adventure game developed and released in 2012 by FX Interactive and Focus Home Interactive. The story is centered around a man called John Yesterday and his investigation of a series of murders in New York. The introduction cut scene made me a little bit on edge, one of the very few ones that ever have, and although it is only about 30 seconds long, it still has that sudden impact that you don’t expect. This is in great contrast to the introduction to the next cut scene where our character of the moment, Henry, and another character (no name mentioned for this lady) are talking about some serial killings of homeless people in the area. Henry’s job is to investigate the areas where homeless people live and are offered shelter. After ignoring his leader's (I’m assuming she is a leader) request to avoid the Cad-Way station, he heads directly there and thas is where the story begins. The games story is one that I would expect to see on the silver screen, it has that perfect level of plot twists, creepy as hell villains, typical clichés that we are all sick to death of and interesting characters with some character development along the way. While the plot twist is kinda obvious and the main cliché done to death I still think that it plays out rather well and holds up well against some of the bigger name game stories that are out today. The user interface (UI) for this game works rather well on both the Windows version and the iOS version. On iOS the items that you can use are at the top of the screen and tapping on them will tell you what you have and show you a bigger picture of said item, dragging an item will allow you to combine the items in you inventory and use items on the surrounding environment to progress the story. On Windows the only real difference is that the items are at the bottom of the screen, everything else (clicking on an item, dragging items) does the same thing. Interaction with other characters is done with simple dialogue choices, there are only 2 minor issues I have with the UI, with the dialogue choices, if you answer a question wrong it will basically say “Hey idiot, try again”, there is no consequence for choosing the wrong answer during those sections. Because of this if you are unsure what to say you can just choose everything until you get the correct option. The other thing is that some times, clicking on things in the environment can be a bit awkward and you may not click on something when it looks like you did, this is because the scenery can be dark sometimes and may hide the item you need. All in all the UI works for the game and doesn’t hinder to much while you while playing the game unless you need to click on something you can only just see. Graphics aren’t too important to me while I play games but the visuals and art style here are very pleasing to the eye. Cell shaded graphics work well and some of the locations are full with things you can see but will rarely feel intrusive. Because it's a point and click adventure game, things in the background have little descriptions and some can be rather funny, including some Easter eggs for you to find. My only gripe is that some of the areas can be a bit dark and make things hard to see. Because the game is only single player and only has one storyline there isn’t much replay value to it. The only replay value I can find in it is seeing how fast I can beat it and playing it again to hear the story, because the it is so good. If you are going to get this game then I would say take a look before you buy it. If you are still unsure, get it on iOS where it costs less (remember that you will need a newer devise so I runs smoothly). All in all the game is a good one with about 2 - 3 hours of play time on your first play through. One of the main problems is the re playability. Because of the puzzles that are in the game it isn't the hardest thing to remember how to get through. I personally believe that this is the main downfall of the game however I do find myself going back to play the game more for the story, much like how I would go back and watch a film regardless of how many times I have watched it.